For 50 years, National PTA’s Reflections program has helped students explore their own thoughts, feelings and ideas, develop artistic literacy, increase confidence and find a love for learning that will help them become more successful in school and in life. Each year, over 300,000 students in Pre-K through Grade 12 create original works of art in response a student-selected theme. 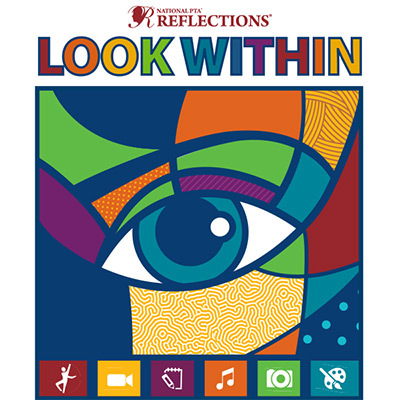 The theme for the 2019-2020 program year is Look Within. Students submit their completed works of art in one or all of the available arts categories: Dance Choreography, Film Production, Literature, Music Composition, Photography, Visual Arts. Student winners from the local level have the opportunity to move up through their district, region, council and state PTA programs to the national level. National Reflections winners are celebrated annually at National PTA's Convention & Expo in June. Join thousands of PTAs across the nation by registering for the 2019-2020 Reflections program. Students or parents interested in participating in the Reflections program should begin by connecting with their Local PTAs. Don’t know how to contact your Local PTA? Use our PTA Local Unit Lookup. PTAs looking to host a Reflections program should begin by reaching out to their State PTA. As Reflections is a state-run program, Local, District, Region and Council PTAs should implement the program based upon the specific forms, deadlines and guidelines which are required by their State PTA. Contact information for State PTA Reflections Programs can be found here. State PTA Reflections leaders should reach out to National PTA to become part of the State Reflections Network to support their Local, District, Region and Council PTAs through the Reflections programs. Student winners from the State PTA level have the opportunity to advance to the national level for recognition and awards. Contact your State PTA Reflections Program, your State PTA or email Info@PTA.org. Register by Feb. 1, 2020 and find tools to run your Local PTA's Reflections program. Learn about our winners, events and exhibits and see what you can win! Apply for a grant and use our toolkit to advocate for arts education.